English Country Style as we know it today, really only emerged during the mid-twentieth century and grew in popularity around the world. 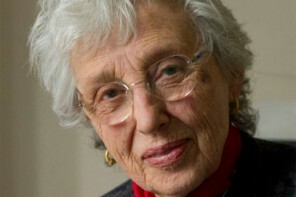 Talented English interior designer John Fowler, and his astute business partner Nancy Lancaster, were seeking to fulfill the emotional and practical needs of their clients renovating country houses, which had suffered a great deal of damage during the occupation of military personnel during World War II. What it did, in its time, was to satisfy a need in England for a style that encompassed principles of order and harmony, a combination of elegance with a lightness of touch. The end result was a style that was aesthetically very pleasing. After World War II John Fowler extracted the very essence of eighteenth century interior design and style and then added the nineteenth century concepts of home, hearth and family. Fowler created an all new ‘eclectic’ English Country Style, one that found favour the world over because of its quality finishes, comfortable connotations, a touch of glamour combining with understated Georgian grace. It was a stress free relaxed type of style in that a book you had been reading left open, alongside newspapers you were going through in a pile, appeared integral to the design. Fowler’s designs were considered ‘modern’ in his time based as they were on his, and his clients, nostalgia for a way of life that had all but vanished under a bombardment of bombs in London. 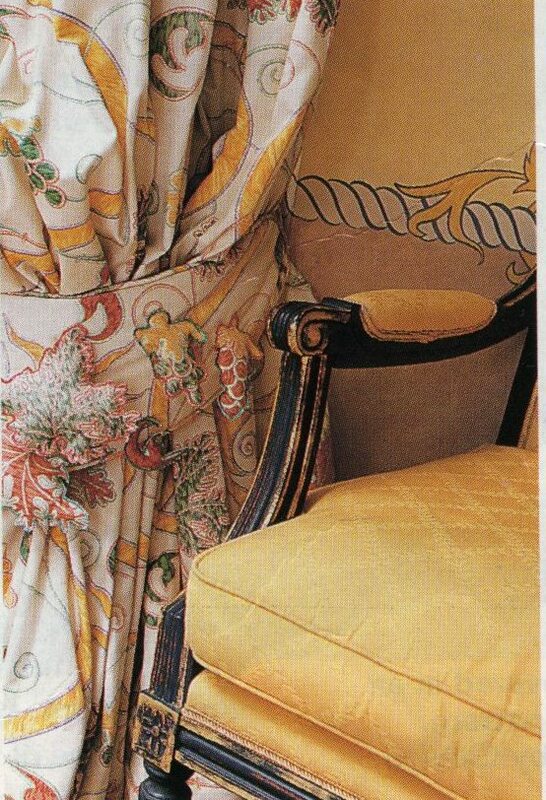 He was further inspired when he met society hostess Nancy Lancaster, whose nostalgia for a ‘genteel’ way of life in the deep south of America from where she had fled following the tragic early death of her first husband, would also influence his developing style. 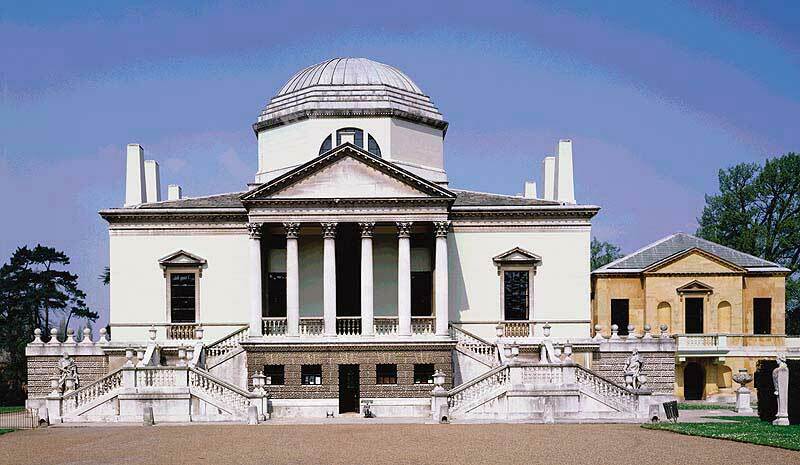 Twentieth century English architectural historian, Sir John Summerson described the English neoclassical style, both inside and out, as ‘that balanced combination of the useful and the beautiful, or prosperity and good breeding’. John Fowler was undoubtedly inspired by the enlightened approach of a clergyman, Canon Valpy, whose bright and breezy rooms at his house at 3, The Close, Winchester had been a revolution in the wheel of taste during the latter years of the nineteenth century. The views of his house now in the Victoria & Albert Museum at London, were commissioned around 1900 from painter Beatrice Olive Corfe, about whom little is known. Canon Valpy was a member of the Chapter of Winchester Cathedral, and a man of considerable private means like Archdeacon Grantley in Anthony Trollope’s novel The Warden. Clearly the Valpy’s were collectors, especially of pictures in a modest way. We can see that the Canon hung an array of ‘improving’ prints, after the great religious paintings of the Italian Renaissance. The prints had been issued in reasonable quantities by the Arundel Society, which had been founded in 1849 under the influence of art critic John Ruskin and Queen Victoria’s consort Prince Albert. The aim was to promote an improved taste in pictures among the public. 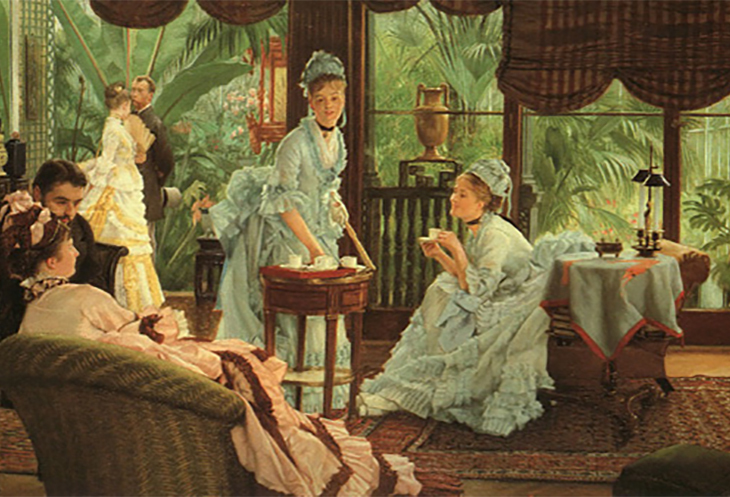 These pioneering color reproductions formed a crucial element in the decoration of many enlightened middle class homes and their popularity persisted well into the new century. 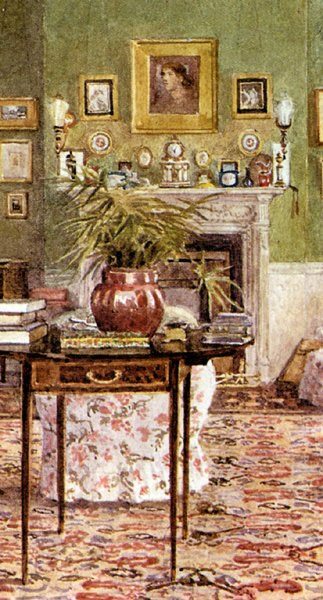 Canon Valpy was undoubtedly a modern chap, as in the centre of his arrangement over the fireplace mantel was also a copy of a now famous portrait of Arts and Crafts design leader William Morris’s wife Jane Morris, rendered in 1869 by painter Dante Gabriel Rossetti, one of the founders of the Pre-Raphealite Brotherhood. Life in the provincial backwater of Winchester was very pleasant indeed, especially around 1901 when King Edward VII came to the throne. 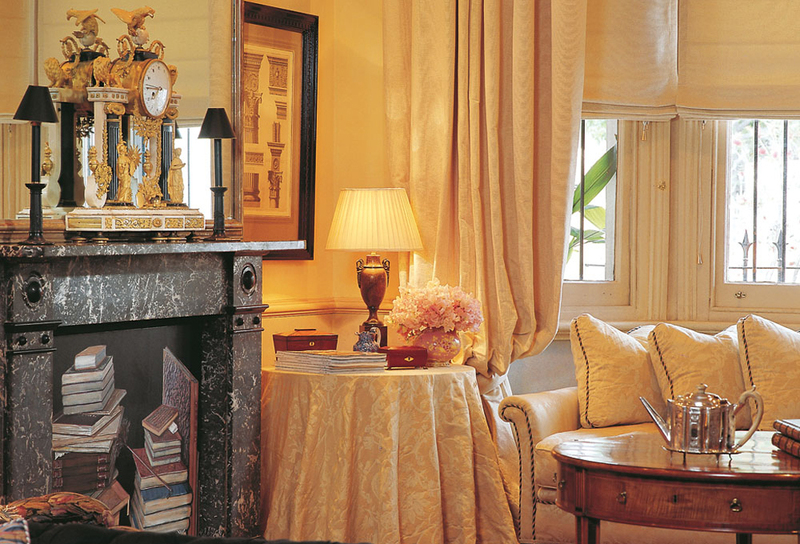 The Canon’s drawing room might be described as having ‘inconspicuous luxury’. It’s certainly very pleasant, airy and homely, although elegant too in that very understated English way. 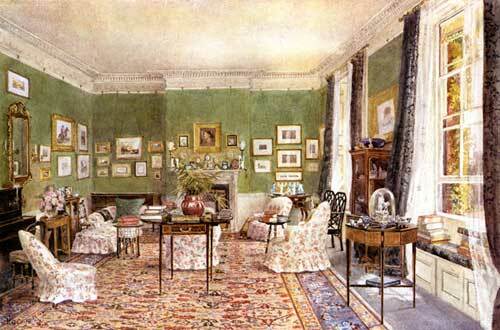 The eclectic nature of the room, with its mix of modern chintz covered comfortable chairs, refined eighteenth century simple furniture, an uncluttered arrangement of well chosen books, objects and pictures is remarkably similar to the more consciously avante garde room arrangements of the London artists and intellectuals of his time. The Canon’s taste for refined eighteenth century style furniture coincided with a revival of all things ‘Georgian’ at the beginning of the twentieth century in a style we now call Edwardian. This was when a desire grew up for a style that was considered to be a reaction to foreign influences, and the stifling nature of pretentious Victorian parlours that were loaded with overstuffed buttoned chairs, sofas and palm trees. Eighteenth century taste and nineteenth century comfort were happily combined and furniture designed by eighteenth century designer Thomas Sheraton and cabinetmaker Thomas Chippendale, mingled happily with more ponderous Victorian style armchairs and easy chairs covered in matching chintz cotton fabrics that were surrounded by skillfully grouped watercolors, hung at eye level to harmonize with the Georgian proportions of the room. The dining room is also decorated with antiques, a new idea at the time one still popular today, and seen throughout the world wherever English people have visited or settled. The classical style had been reborn in Europe during the Italian Renaissance (15th and 16th centuries) when Venetian Architect Andrea Palladio (1508-80) designed a series of villas for private clients in the Veneto, Italy. 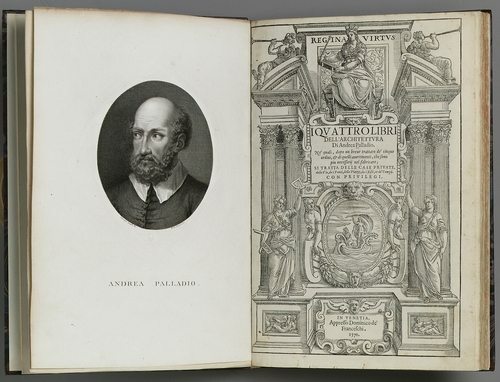 His designs published in his I Quattro Libre, were based on his understanding and interpretation of the measurements and writings of Roman 1st century architect, Marcus Pollio Vitruvius, whose treatise on architecture had been found in 1430 perfectly preserved in a monastery library. 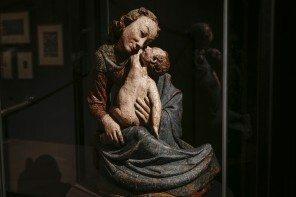 It is the only such work to have survived from antiquity. In Italy the towns Herculaneum and Pompeii were excavated from 1738 and 1748 respectively and the archaeological findings co-related to theories and practical building recipes and solutions, detailed in Vitruvius’s treatise and so they gained credibility. 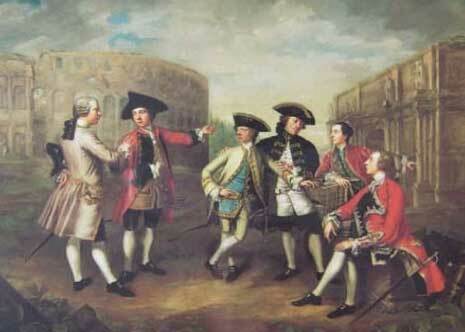 English aristocrats refined elegance during the Georgian era, which encompassed the reign of the first four Kings named George from 1714 to 1830. This was when polite society was striving for aesthetic perfection especially in their houses, which were set in almost perfect landscapes. They were urged on by an awareness of, and appreciation for the ‘antique’, striving to emulate the ideal – classical perfection. English Palladianism (or the neoclassical style) of the eighteenth and early nineteenth centuries in England became highly influential in America through the support of American President Thomas Jefferson, at least until the advent of American architect Frank Lloyd Wright and the arrival of Modernism (late 19th century). Giacomo Leoni completed the work at Lyme Park in Cheshire during the 1720’s. 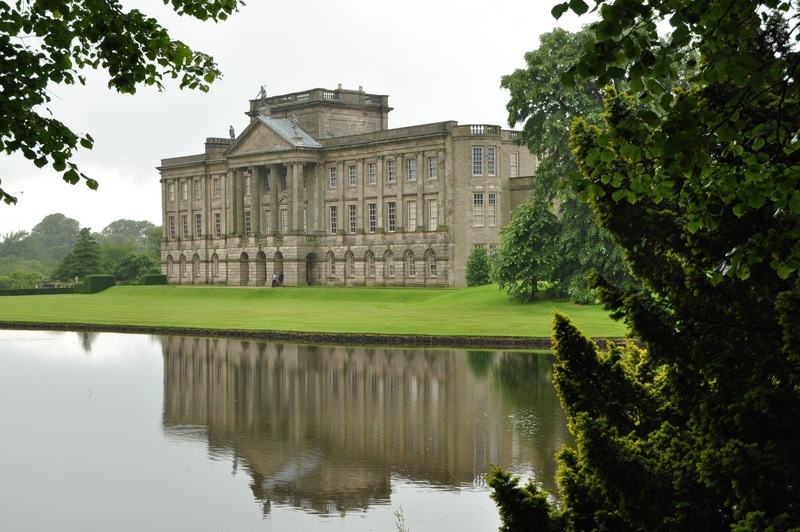 It is very like Pemberley, the house owned by Mr Darcy as detailed in Jane Austen’s novel Pride and Prejudice which was viewed by an admiring Elizabeth Bennett and her aunt and uncle when the housekeeper showed them around. It is the sort of house the man who gained her affections, Mr Darcy, would have owned, with its central portico, flanking wings, rusticated basement area, piano nobile or noble first floor and a view, or prospect out over the gardens and surrounding countryside. The 3rd Earl of Burlington, Richard Boyle, set the tone first by building a classic Villa at Chiswick on the outskirts (then) of London, purely to entertain his friends. He, his designer William Kent, as well as Scottish Architect Colen Campbell had a profound effect on the future of domestic house design in England. English Country House interiors until this time had not been entirely satisfactory because there was no historical precedent, except for Roman Temples. 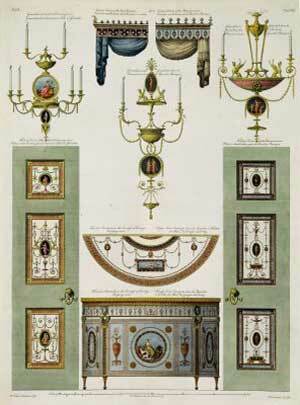 These certainly did not suit an English gentleman’s domestic arrangements at all. 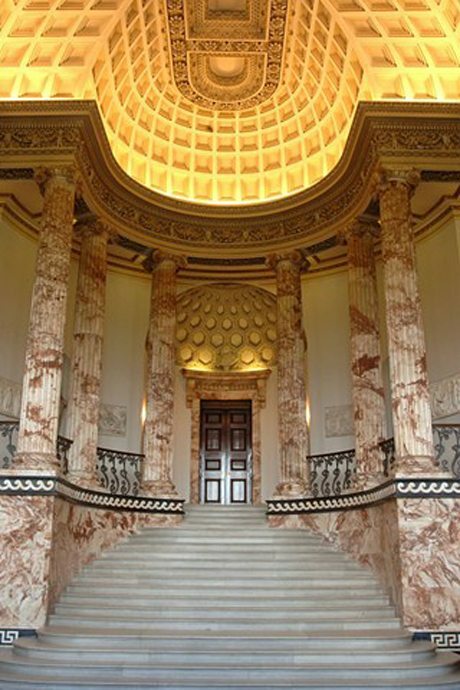 At Holkham Hall in Norfolk Thomas Coke, 1st Earl of Leicester, ended up with a marble entrance hall designed by William Kent, looking for all the world like a giant Roman Bath. This dilemma continued until after 1759, when Scottish Architect Robert Adam (1728 – 1792) arrived to set up practice at London. Having travelled extensively on the continent, surveying classical architecture and ruins first hand, Adam who also had extensive practical experience previously in his father’s architectural practice in Edinburgh, was in a position to answer demands for a more imaginative use of contrasting room plans and to enlarge the repertoire of decorative motifs that could be used. Robert Adam’s work has been described as having an air of unceremonious good manners and unostentatious opulence, perfectly reflecting the civilized world of his patrons. The proportions, which governed his interiors, is a formulae whereby all the elements of the room were directly related to each other and to the scale of the human figure. This meant they were not only pleasing to the senses, but also to the eye and it is why Georgian residences achieved such a following. The neo-classical motifs he used included: the urn, the vase, wreaths, the drop, swags, garlands of flowers, acanthus leaves, anthemiom, paterae and medallions, were all enthusiastically taken up and copied. 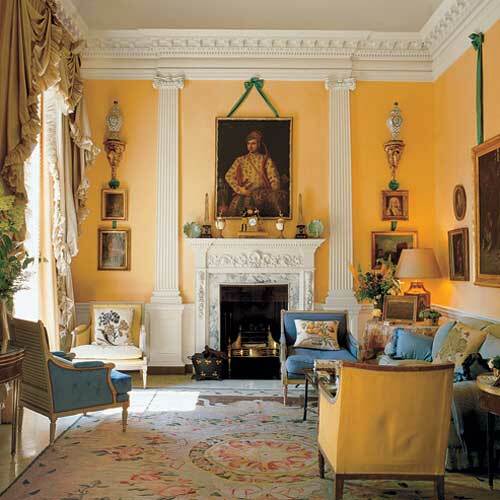 He created a graceful neoclassical interior that satisfied many needs, providing the foundation for an elegant English country house style, which was skilfully re-interpreted by those who came after. This included John Nash (1752-1835) architect to George IV and Sir John Soane (1753-1857), who interestingly purchased, after he died, all Robert Adam’s drawings, saving them for posterity. At his own house in Lincoln Inn Fields at London Sir John Soane pared down the elements of the Neo-classical Style even more, into a simplicity of line that then inspired late nineteenth century ‘modernists’. Contemporarily today, they still inspire classical ‘minimalists’. 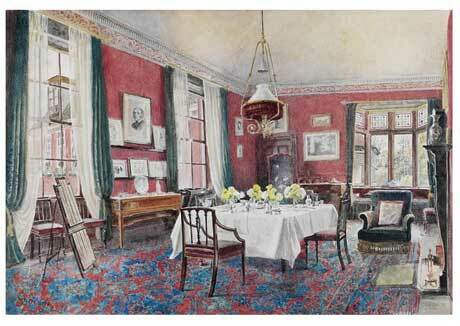 While the English Country Style became popular through the influence of John Fowler and Nancy Lancaster, today there are many medium sized provincial houses in England with Drawing and Dining Rooms that still look remarkably like Canon Valpy’s, despite the world of interiors changing many times since around them.